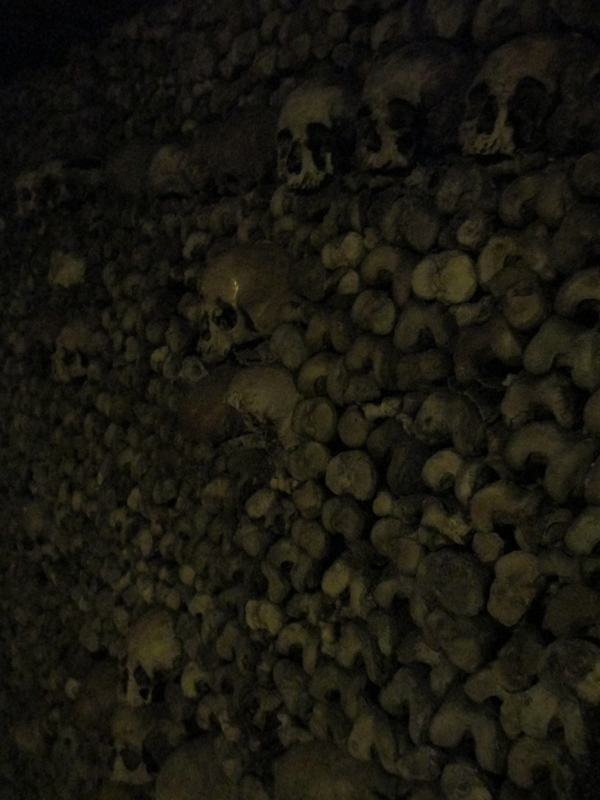 The catacombs beneath Paris are one of the most haunting, but in many ways most beautiful places I have ever been. 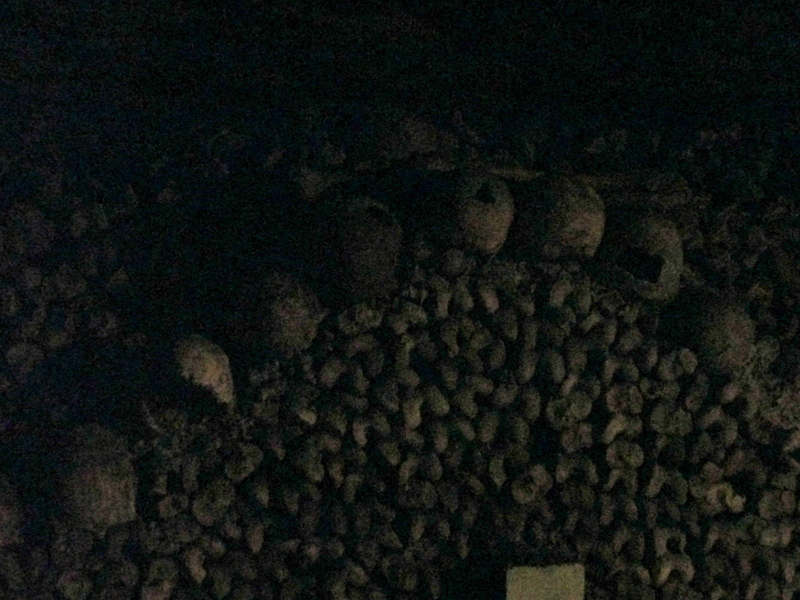 The catacombs are entered through a very inconspicuous building. But once you walk down the 126 steps what you find is a completely different world. 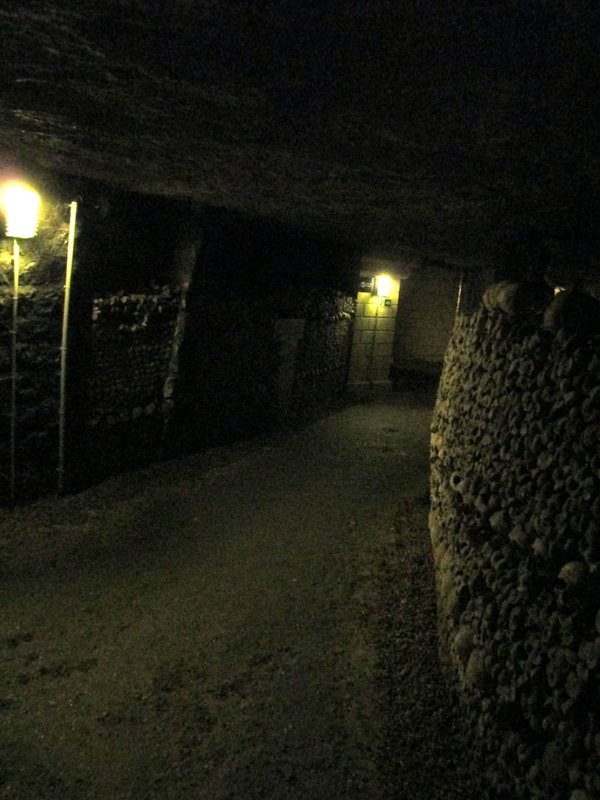 The catacombs occupy only 1/800th of the quarries that honeycomb the earth beneath Paris and they were begun in the 1700s. 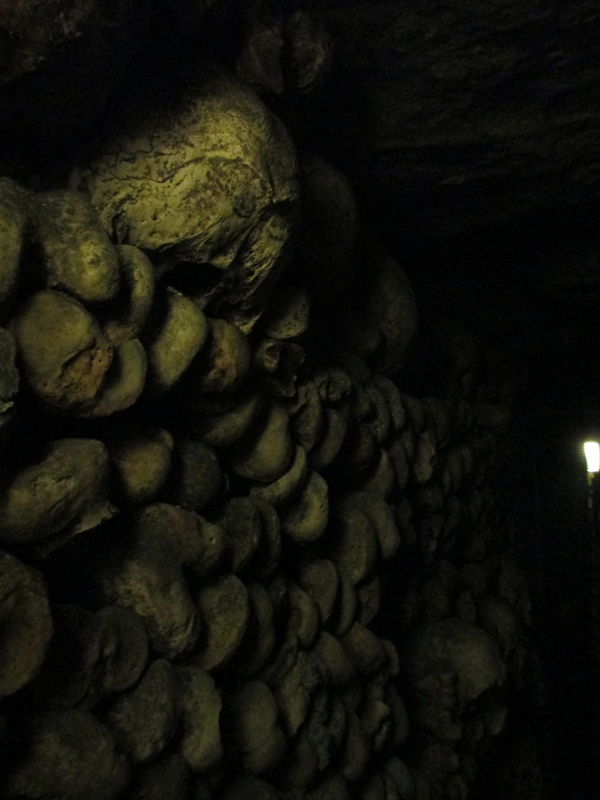 They are the largest catacombs in the world and hold around six million skeletons. 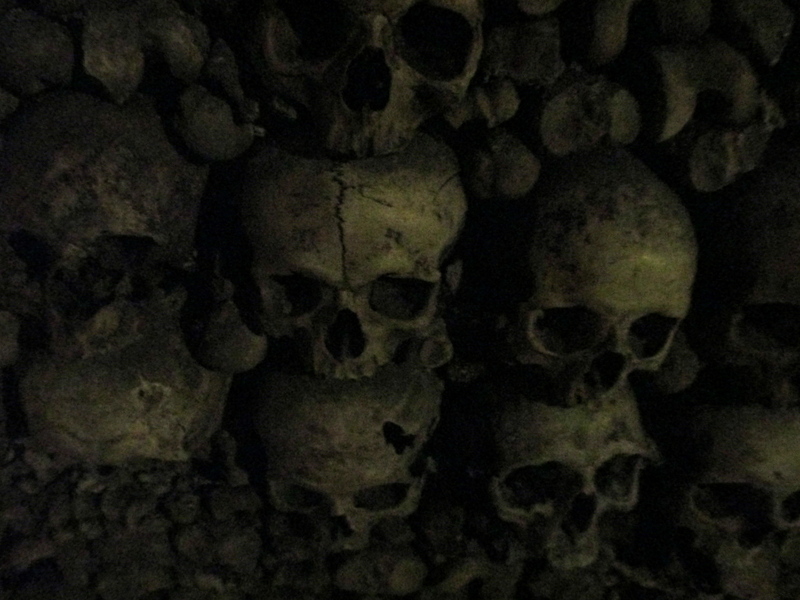 The catacombs were built to solve a very specific problem. 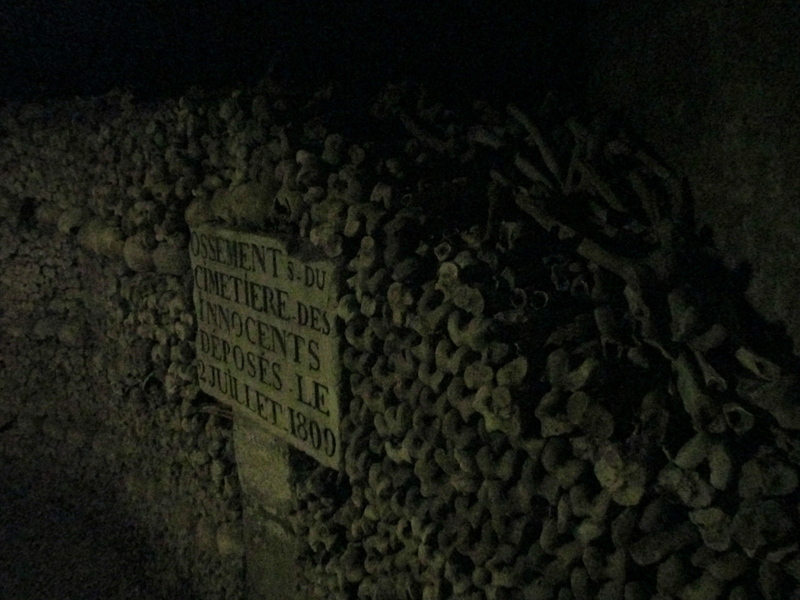 By 1785 the cemetery of innocents, in the vicinity of Les Halles, had been in use for nearly ten centuries and had become overcrowded and was a serious source of infection. On the 9th of November 1785, after many complaints from local inhabitants, the Council of State decided to close the cemetery to any more internments and to remove its contents. A general survey of the quarries of Paris had just been completed and it was decided to use them to re-inter the inhabitants of the cemetery. Rebuilding work to strengthen them was undertaken on the sections of the quarries that were to be used and a staircase was put in. The first re-internments in the catacombs began after the consecration and the blessing of the site on the 7th of April 1786. This particular period of re-internment continued until 1788. The re-internment was always done at nightfall and followed a ceremony where a procession of surplice garbed priests sang the service for the dead along the route of the carts carrying the bones. The carts were covered by a black veil. 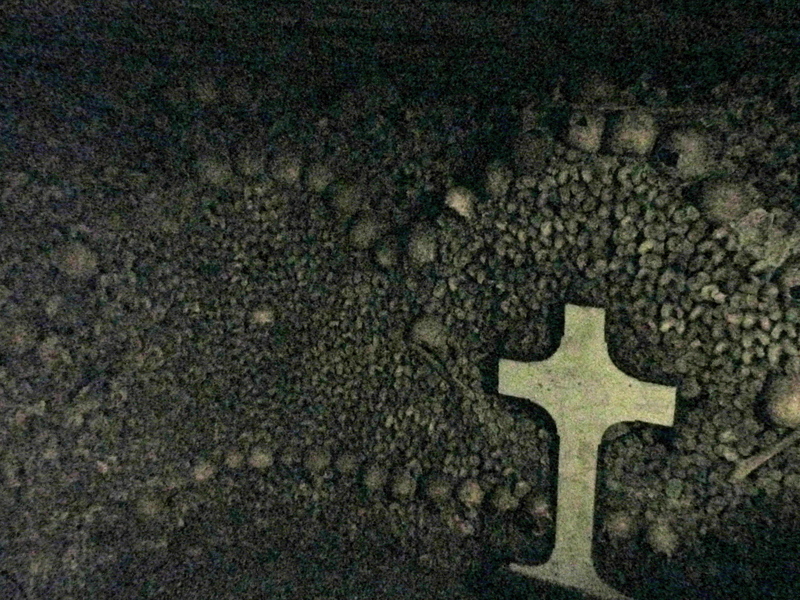 The bones were then placed in the catacombs. 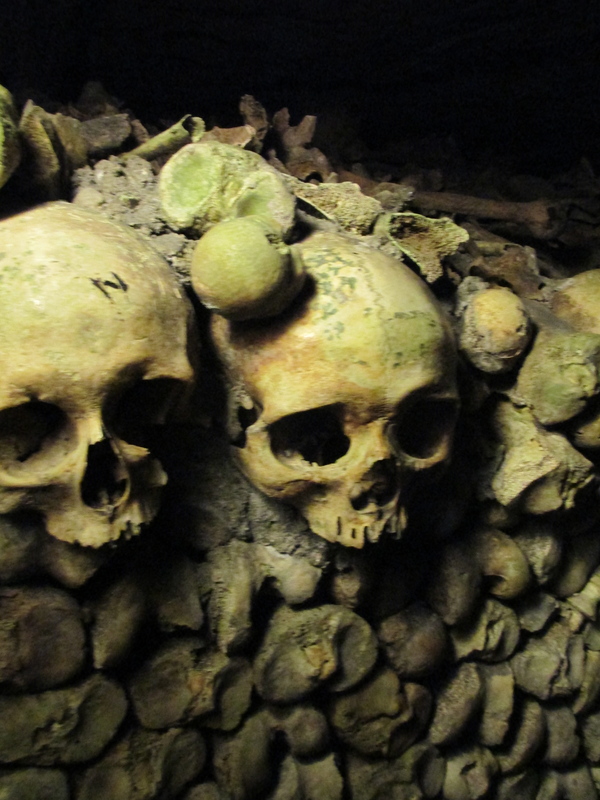 This process was continued until 1814 as remains from other cemeteries were removed and re-interred in the catacombs. More remains were re-interred between 1842 and 1870. 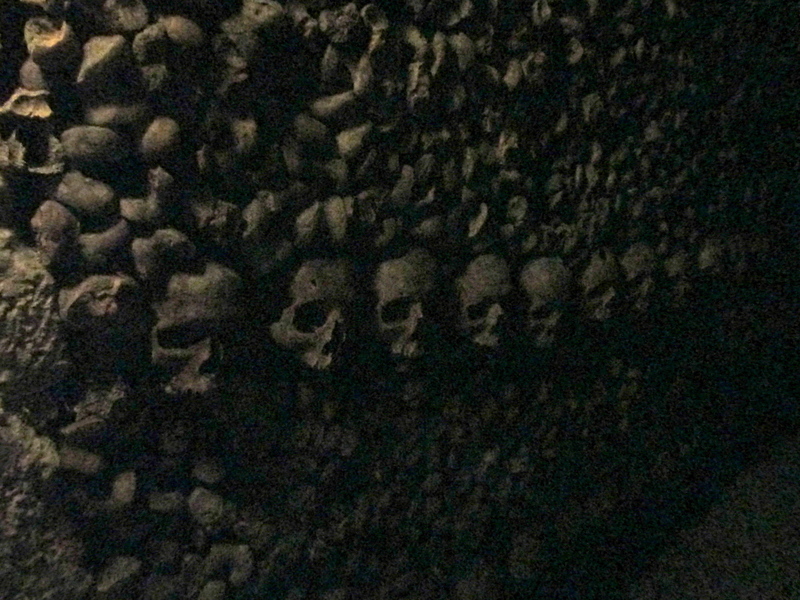 The catacombs became an unlikely tourist attraction. In 1787 the future Charles X made the descent accompanied by some ladies of the court. In 1814, Francis I, the Emperor of Austria, visited them and in 1860 Napoleon III went down accompanied by his son. They remain a tourist attraction today with thousands coming each year and queueing for hours for entrance. The outwards facing sections of the walls of bones are built mainly of leg and arm bones with skulls interspersed in between. As you can see from the photos much of the building has been quite decorative. 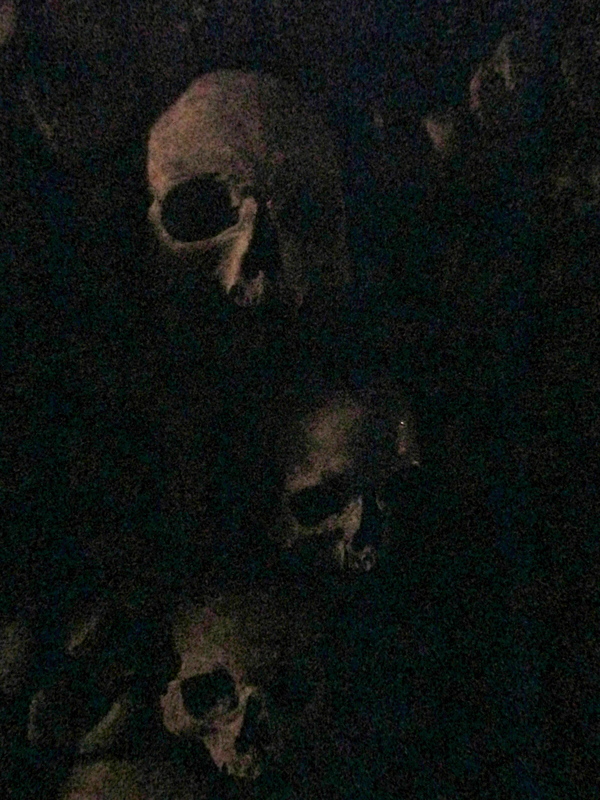 Sadly some of the skulls have been graffitied, see photo below, and some people try to steal bones. All bags are searched on the way out. 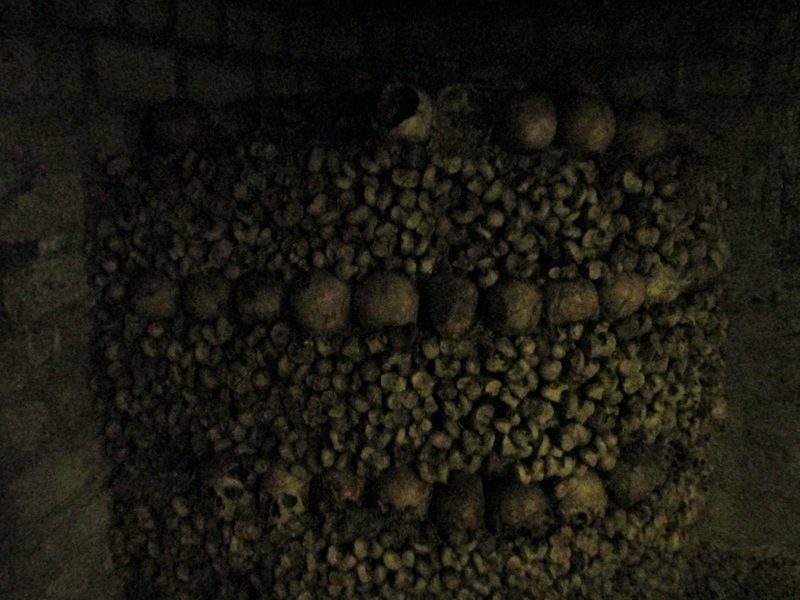 I have never had a greater sense of the mortality of humanity and the crushing passage of time than I have had in the catacombs. The one phrase that kept going around and around in my head like a broken record was: remember man thou art but dust and unto dust thou shall return. Nowhere have I seen greater evidence of that. 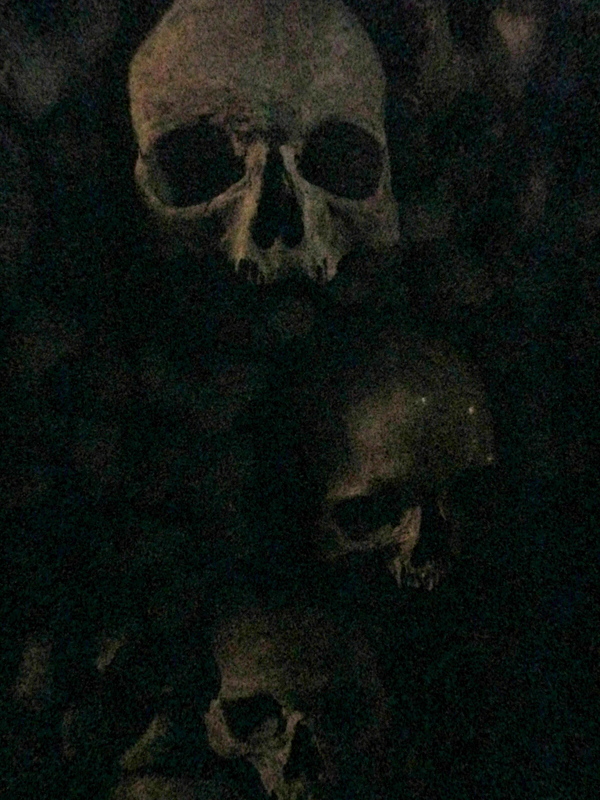 The photo from the entrance to the catacombs is from http://en.wikipedia.org/wiki/Catacombs_of_Paris. The remainder are my own. 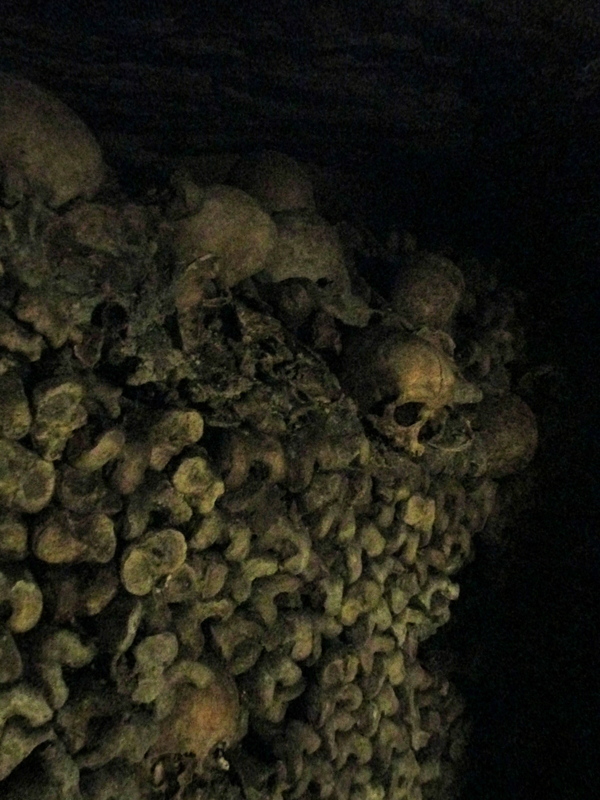 http://www.catacombes.paris.fr/en/catacombs or visit if you are ever in Paris. Though I recommend getting there really early. 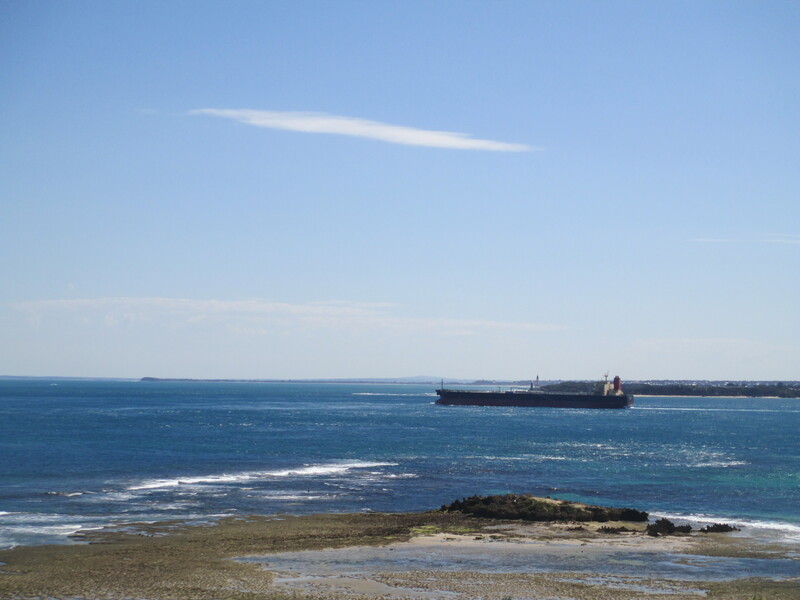 Point Nepean: the end of the Mornington Peninsula, one of the ‘heads’ of Port Phillip Bay, a national park, the site of a disappearance of an Australian Prime Minister, a series of army forts, a former army training area and the site of the first shot fired by the British Empire in WWI. For those who haven’t been there Point Nepean is about an hour and a half’s drive from Melbourne Australia. It is is one of the few places where you can stand on a spit of land with the ocean on one side and the bay on the other. It is also the place that claimed one of Australia’s Prime Ministers. Harold Holt went swimming at Cheviot beach, see the photos below, in December 1967. He never returned. He was officially pronounced dead on the 19th of December. There have been many theories over the years, ranging from a Japanese submarine to sharks. The last is actually a possibility. I think he just drowned. 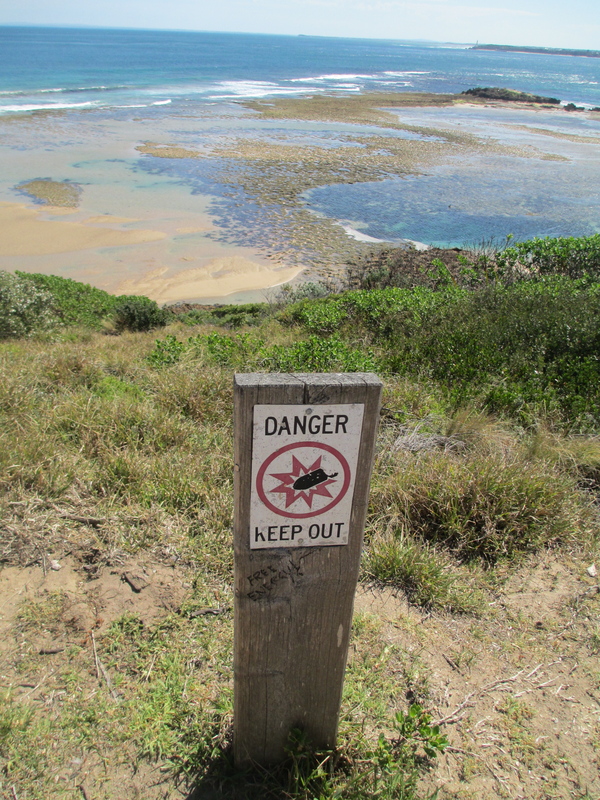 It is a very unsafe swimming beach with unpredictable currents and frequently a number of rips. 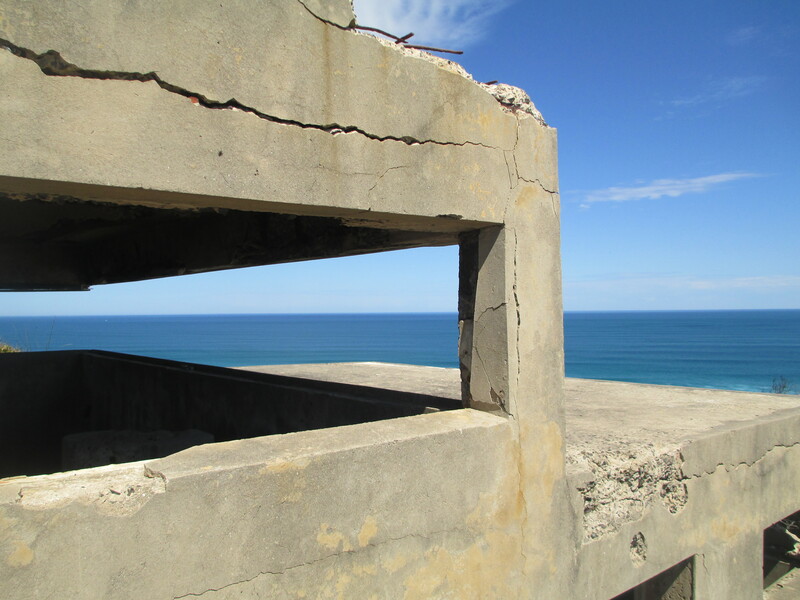 There are also several of army forts along the length of Point Nepean, from WWI and WWII, such as the Cheviot Beach fortifications, Fort Pearce and the Eagle’s Nest. All of which can be seen in the photos below. 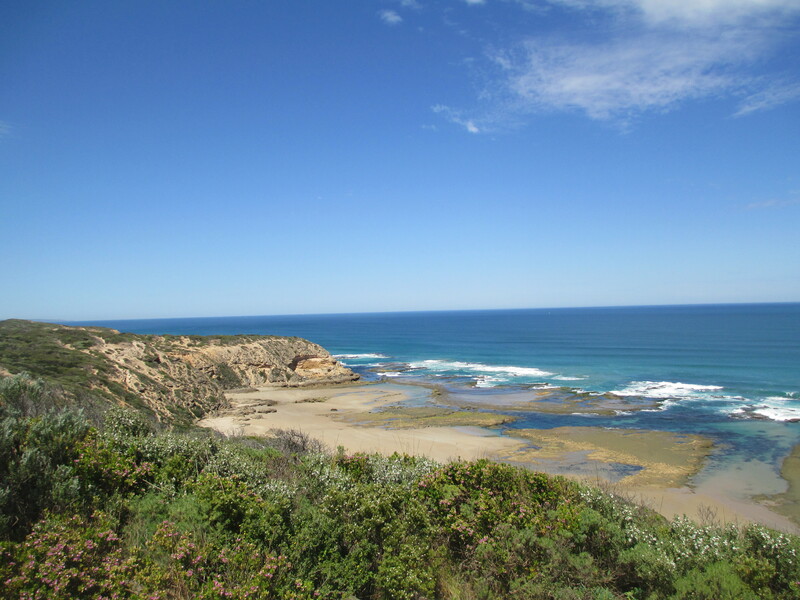 Point Nepean is probably best known for the role it played in WWI. WWI was declared at 11pm on the 4th of August 1914 in Britain (9am of the 5th Australian time). A German cargo steamer the SS Pflaz, having anticipated a declaration of war, was trying to get clear of the heads of Port Phillip Bay and find a neutral port in South America. 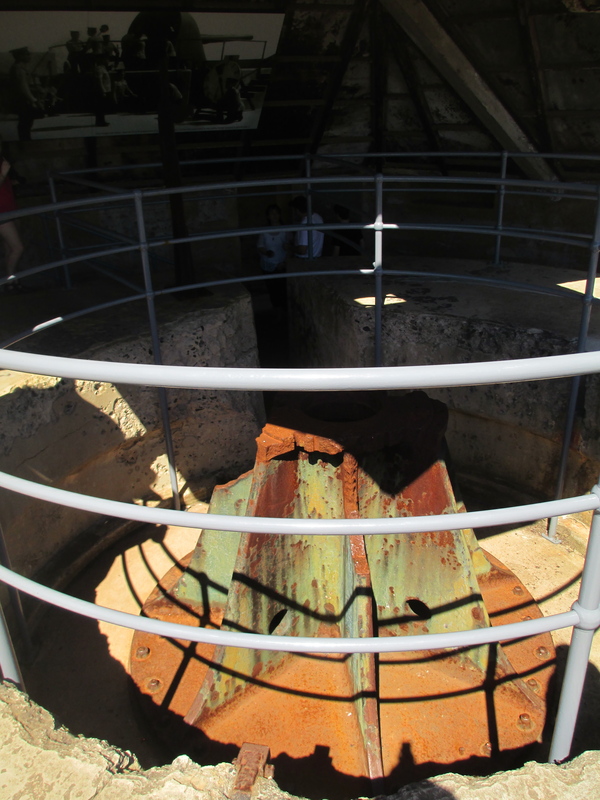 Incidentally Fort Nepean also fired the first Australian shot from WWII on the 4th of September 1939. The SS Woiniora failed to identify itself as it came through the heads. Once the correct code was signalled the ship was allowed to continue on its way. The remains of the gun below are in the position the shot was fired from and the other photo is the view from the gun emplacement. 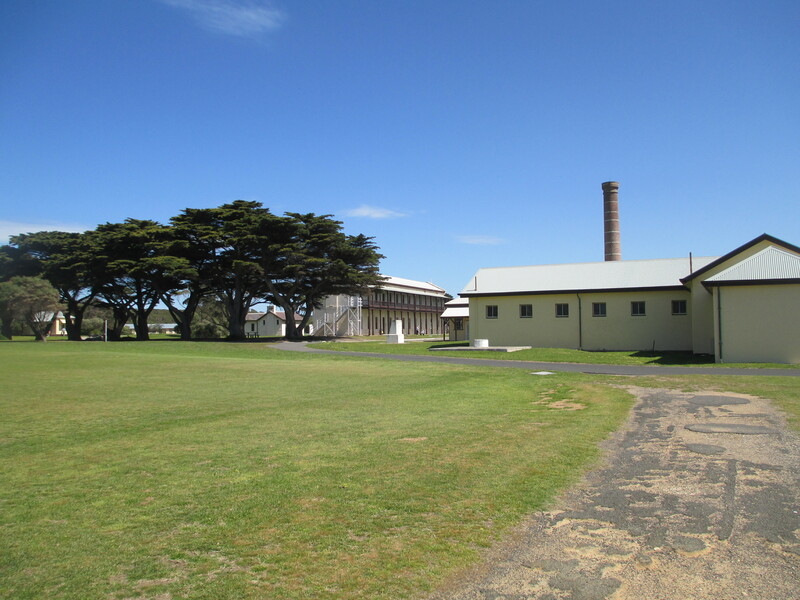 Point Nepean also served as a quarantine station from the 1850s until 1952 when it was taken over by army cadets, with the proviso that it would be vacated if it was needed again for quarantine. Many immigrants were quarantined there from passengers, steerage and first class, from the 1850s all the way through to assisted immigrants in the early 1950s who were kept there while their belongings were fumigated against foot and mouth disease. 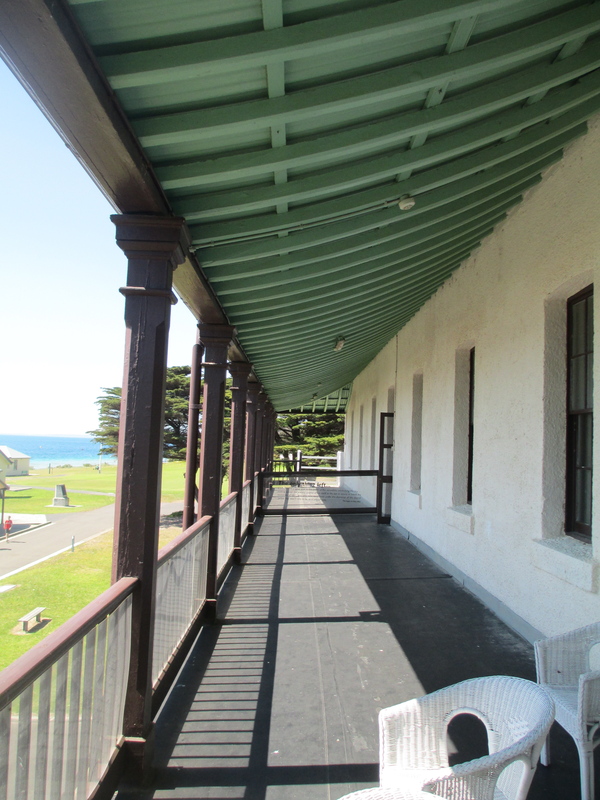 1912 saw the largest intake of the quarantine station with 1291 from the ship, the Irishman. They were mainly agricultural labourers. 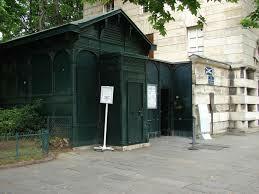 The photos below are some of the quarantine buildings. The final photo is the view along the balcony of one of the hospital buildings. Also Point Nepean has been in use as an army base of some form for centuries and there are many of the beaches you still can’t walk on because of unexploded ordinances. 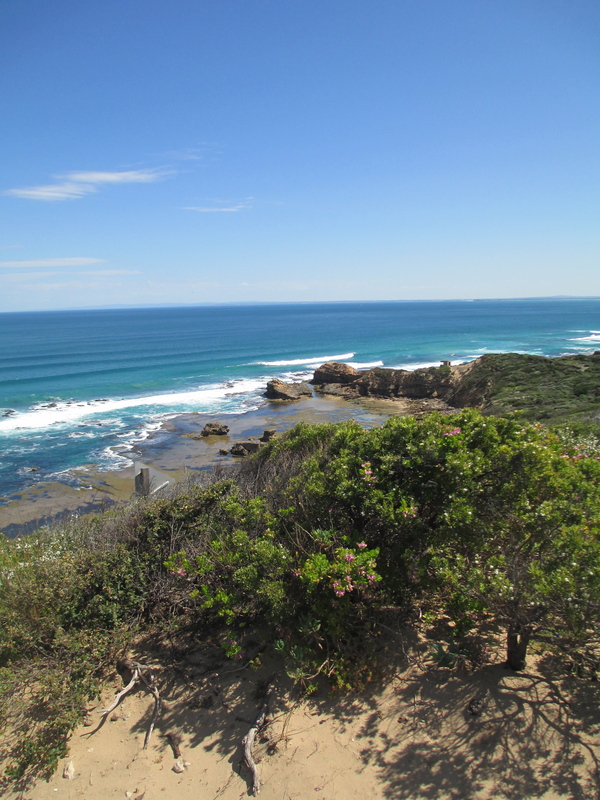 Point Nepean is a truly beautiful piece of land as well as a fascinating peace of history. If you get the chance to go there, it’s worth it. It is quite lovely and for the moment very unspoiled. You may have seen this already, but it is absolutely fascinating. A Viking Hoard has been found in Dumfries in Scotland. There are some truly beautiful items. The Hoard dates from the 9th and 10th centuries and contains over 100 artefacts. Have a look at http://www.medievalists.net/2014/10/13/viking-hoard-discovered-scotland/ for more information. 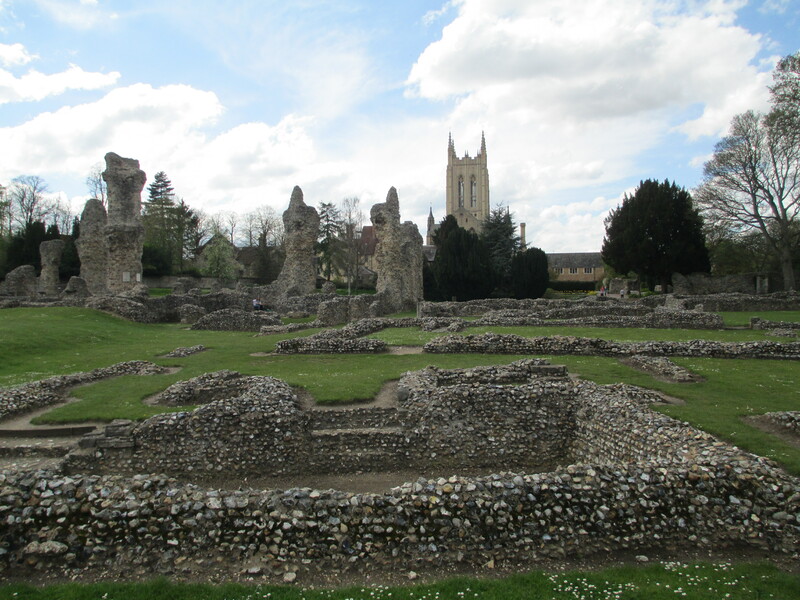 The abbey at Bury St Edmunds is only ruins today, but it was once one of the largest and most powerful abbeys in England. It was home of the Chronicle of Bury St Edmund’s and was one of the places that the Magna Carta was planned. It was a casualty of the dissolution of the monasteries, handed over to the king in 1539. There isn’t a lot left now, but what remains is majestic and poignant. It allows a glimpse of how spectacular the abbey would have been in all its glory. The tallest pillar you can see to the left of the picture is near where the Magna Carta barons met to swear on the altar of St Edmund that they would obtain ratification of the Magna Carta from King John. The plaque below is affixed to it. St Edmund’s is also the abbey that Eustace, the wildly unpopular son of King Stephen, plundered right before he died unexpectedly, possibly from choking to death. Many felt that his death was divine wrath, similar to the death of Henry the Young King. 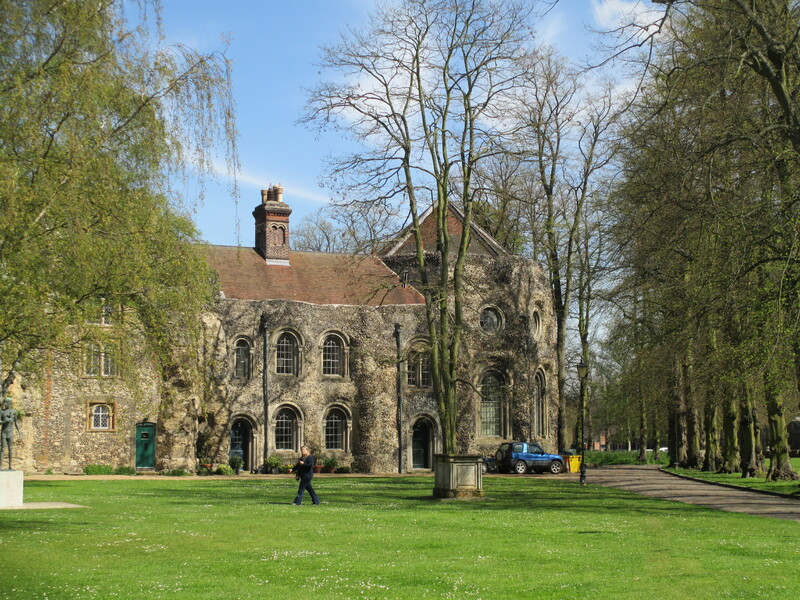 The Chronicle of Bury St Edmunds was also written at the abbey. The Chronicle was written by Jocelin de Brakelond who was the chaplain of Abbot Samson. Samson was one of the Abbots who had the most structural influence on the abbey. Samson completed the great western front of the abbey. More of the west front survives today than any other part of the abbey, but it is largely houses. You can still see the remains of Samson’s great arches. 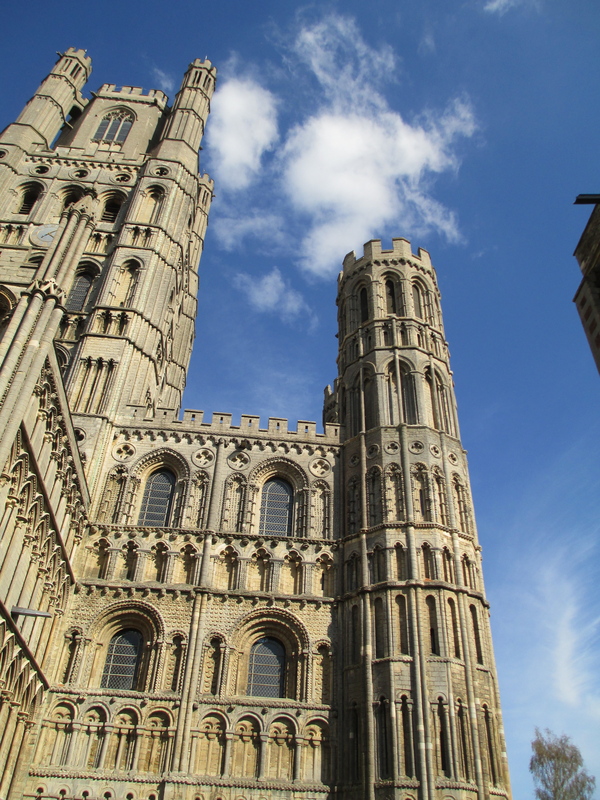 Samson also had an almost competition with Geoffrey Ridel who was Bishop of Ely. Geoffrey requested that Samson let him have oaks from Elmsett for his own building operations at Ely and Geoffrey had secretly gone through and marked the trees he wanted. Samson felt he had to agree, but he immediately felled the best oaks in Elmsett for his own works. This is an excellent illustration of the competition between the large religious institutions. You can see Ely Cathedral below. Samson’s works on the abbey and general life at the abbey over this period , 1173-1202, are the main subjects of the Chronicle. It also provides an intriguing picture of Samson himself. “ABBOT SAMSON was below the average height, almost bald; his face was neither round nor oblong ; his nose was prominent and his lips thick; his eyes were clear and his glance penetrating; his hearing was excellent; his eyebrows arched, and frequently shaved; and a little cold soon made him hoarse. On the day of his election he was forty­ seven, and had been a monk for seventeen years. In his ruddy beard there were a few grey hairs, and still fewer in his black and curling hair. But in the course of the first fourteen years after his election all his hair became white as snow. He was an exceedingly temperate man ; he possessed great energy and a strong constitution, and was fond both of riding and walking, until old age prevailed upon him and moderated his ardour in these respects. When he heard the news of the capture of the cross and the fall of Jerusalem, he began to wear under garments made of horse hair, and a horse­ hair shirt, and gave up the use of flesh and meat. None the less, he willed that flesh should be placed before him as he sat at table, that the alms might be increased. He ate sweet milk, honey, and similar sweet things, far more readily than any other food. He hated liars, drunkards, and talkative persons; for virtue ever loves itself and spurns that which is contrary to it. He blamed those who grumbled about their meat and drink, and especially monks who so grumbled, and personally kept to the same manners which he had observed when he was a cloistered monk. Moreover, he had this virtue in himself that he never desired to change the dish which was placed before him. When I was a novice, I wished to prove whether this was really true, and as I happened to serve in the refectory, I thought to place before him food which would have offended any other man, in a very dirty and broken dish. But when he saw this, he was as it were blind to it. Then, as there was some delay, I repented of what I had done, and straightway seized the dish, changed the food and dish for better, and carried it to him. He, however, was angry at the change, and disturbed. This excerpt offers an intriguing glimpse into the world of Bury St Edmund’s. 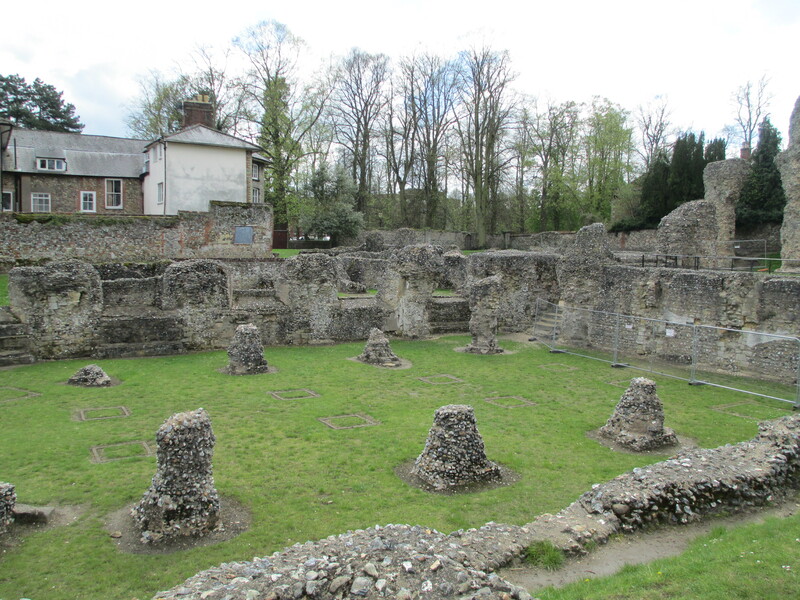 The remains of St Edmund’s Abbey are like the bones of a giant, you can see the greatness that was once there. The first photo below shows the remains of what would once have been a beautiful window and the second shows that bases of pillars that held up part of the church. One of the pieces that has survived the destruction of the abbey is the Norman Tower. 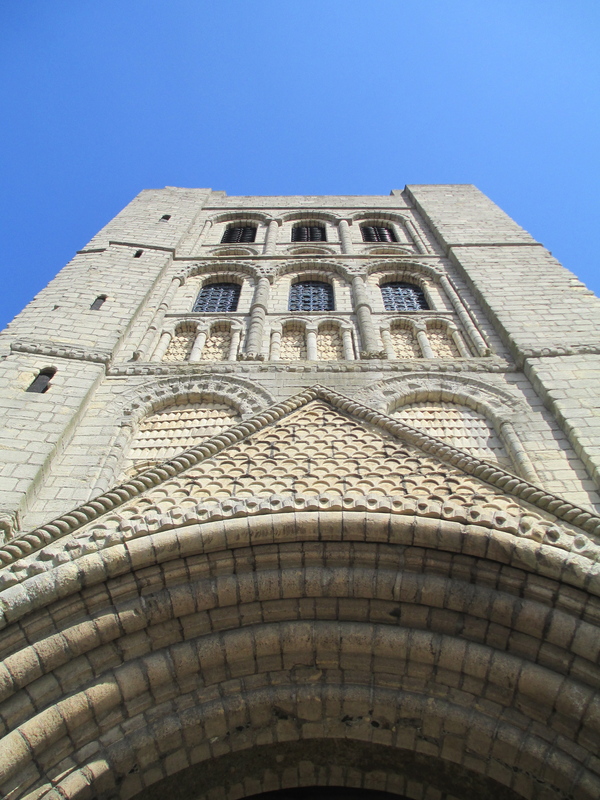 It was built 1120-1148 and was designed to be both a gateway to the abbey church and a belfry for the church of St James next door, it still serves as a bell tower. It was funded by Abbot Anselm instead of a pilgrimage to St James De Compostella. The carved stone work that survives is truly beautiful. 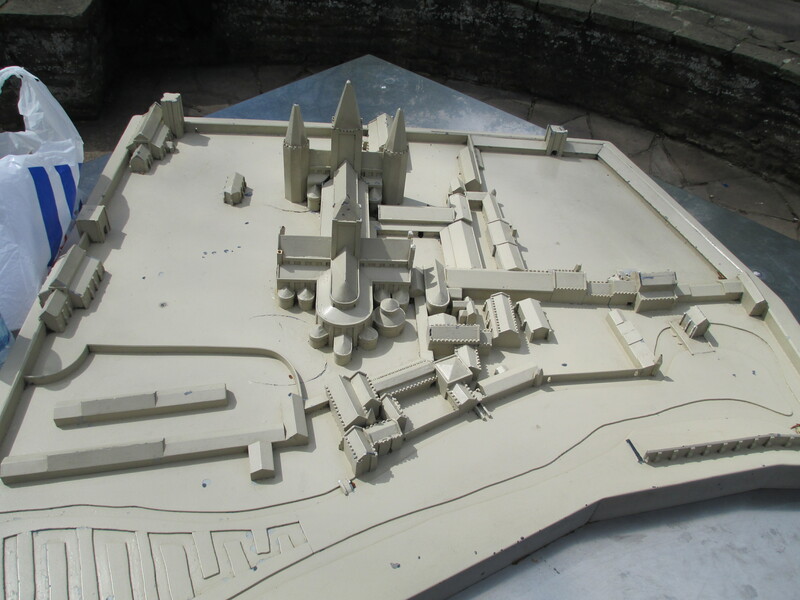 Bury St Edmond’s was once one of England’s most important and majestic abbeys, you can see from the model below just how large it was, there might not be much left now but there are at least still echoes of the past.